Puppies that were beheaded and thrown in the nala. Hyderabad: The carcass of five beheaded stray puppies was recovered from an unused cement tunnel (pipeline ) in Paridhi Vada of Puranapul, Old City on Monday morning. The pups were reportedly killed by a drunken man because he felt offended as the dogs had barked at him. 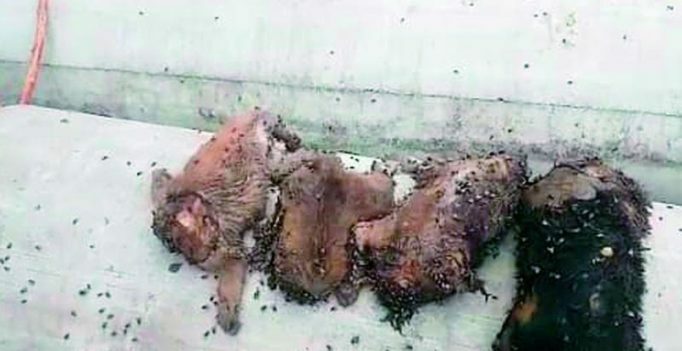 The decapitated bodies of four puppies were recovered but the fifth one was found completely beyond recognition, with the skin also peeled off. Mr Kranthi Raja a resident of Pardivada Puranapul, an animal welfare volunteer and who often fed these puppies, last saw the them on Sunday evening barking at a drunk man, who is yet to be identified by the police. Mr Raja informed the Gowliguda police, through a formal complaint, that, he found the mother whining next to a tunnel and when he peeped in, he found the five beheaded puppies. The bodies were buried in an open ground at Purnanapul, no post-mortem was conducted. No case has been booked so far.